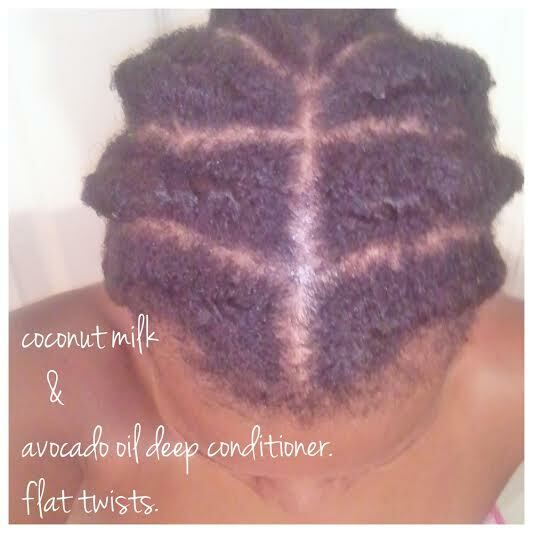 coconut & avocado oil deep conditioner. After all these years of being natural, I finally realized my main curly girl dilemma. It has been my battle with properly conditioning. When I first BC’d (big chopped) my hair, wash-n-gos were a way of life. They required very little maintenance. As my hair has grown, I’ve found it more and more difficult to maintain length. Mostly because I am stuck in the wash-n-go way of life. This month during my 30 Day Challenge, I have been discovering new ways to care for my hair. Including new styling, washing, and conditioning methods. Divide hair into four sections. Apply conditioner from root to tip of hair, twisting sections as you go. Wrap hair in shower cap and towel for 30 minutes up to overnight. Style in desired protective style. Still working on my protective stylings, but here’s a start. It’s 2014, and with a new year, I’m trying to be a little more outgoing with hair styles. Simply not having enough time should no longer be an excuse, especially when it comes to bantu knots. This style is probably the easiest natural hair style I’ve done so far, and from my experience, I love the results. To all you curly girls with too much length for TWA, but not much length to do more than a wash n’go, this could be your solution. Simply, part damp, moisturized (I use raw shea butter) hair into sections. The way I achieved the style pictured is by first sectioning hair and doing two-strand twist. After completing each twist, I twirled each twist until it naturally curled up into a knot, tucking the end under. Leave knots in until hair is completely dry. Carefully, undo twist. Unwrapping each twist. I learned if you just pull twist apart, this will cause a lot of frizz. Achieve your finally style playing around with parts, accessories, and front twist.